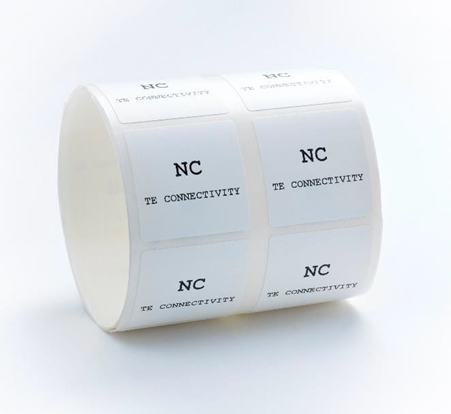 DARMSTADT, Germany – Dec. 6, 2018 – TE Connectivity (TE), a world leader in connectivity and sensors, is offering its Nylon Cloth Flagging Labels. The versatile labels are designed to be used either flag style or conformed to an irregular surface. TE’s Nylon Cloth Flagging Labels (NC) are thermal transfer printable, flexible nylon cloth with a permanent acrylic adhesive. There are two primary ways to use Nylon Cloth Label. When used as a flag, the label will wrap around an individual wire leaving a raised flag for identification. When used flat, Nylon Cloth labels have excellent conformability when adhering to surfaces that are irregular, round or flexible. The labels meet the environmental requirements needed for the following industries; aerospace, defense, electronics, industrial and telecom. The NC label is thermal transfer printable and 178µm (0.0070”) thick with an acrylic adhesive. Made from highly durable material with indoor applications, nylon cloth labels can withstand the harshest environments, including temperatures from -40°C to 145°C (-40°F to 293°F). Nylon Cloth Flagging labels are available in several widths from 6.4mm to 50.8mm (0.25” to 2.0”) with heights from 6.4mm up to 12.7mm (0.25” to 0.5”). In addition, a surface coating enhances the ink receptivity with TE Connectivity’s range of thermal transfer printers, ribbons and software. Nylon cloth labels are designed to identify wire and cables as well as board level components.